Migis Hotel Group and their investors announced today that they plan to break ground on the new Groton Inn in Groton, Massachusetts in late fall 2016. 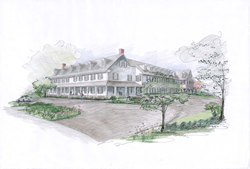 The new Groton Inn will reference the historic design of the original Old Groton Inn, which was destroyed by fire in 2011. Located at 128 Main Street and overlooking the preservation land on Gibbet Hill, the new Groton Inn is expected to open in fall 2017. In 2015, the family-run Migis Hotel Group partnered with investors to develop a plan for a new 60-room inn that takes inspiration from the earlier building’s classic New England architecture. Groton’s Historic District Commission and Planning Board have since approved the design of the building. The façade of the new Groton Inn will be a replication of the exterior of the historic clapboard building. With 60 four-star quality rooms, a banquet hall with seating for up to 110 people and modern amenities, the new Inn will be a gracious and sensitive update of this one-of-a-kind property. Adjacent to the Inn, a new freestanding barn-style restaurant will be built and feature locally sourced beer and wine and farm-to-table produce and beef from Gibbet Hill Farm. With the comfort and elegance of a grand bed-and-breakfast, the new Groton Inn will hearken back to an era gone by. Once considered one of the nation’s oldest operating inns, the Old Groton Inn consisted of three historic structures, with the oldest part of the Inn dating from 1678. From 1797 to 1847, the Inn served as a meeting place for St. Paul's Masonic Lodge, where Paul Revere was Grand Master. Presidents Ulysses S. Grant, Grover Cleveland, and William H. Taft also stayed at the Inn. Listed on the National Register of Historic Places in 1976, the Inn was severely damaged by fire in August 2011. Although preservationists and residents attempted to save the building, the owners chose to demolish it in November 2011. In 2013, a group of investors purchased the property and in 2015 Migis Hotel Group partnered with this group to build a new inn. Taking inspiration from the Abenaki word migis, a place to steal away to rest, Migis Hotel Group (MHG) is a family-run, Maine-based, and very personalized hotel management company founded in 1968. Operating boutique hotels, destination resort properties, and award-winning dining facilities, MHG properties offer guests a welcoming environment for rest and relaxation from an often hectic and overburdened life. MHG strives to provide each guest with heartfelt hospitality and a memorable dining experience for an exceptional value. Current properties managed include Migis Lodge on Sebago Lake, Maine; Black Point Inn on Prouts Neck, Maine; The Inn at Ocean’s Edge, Lincolnville, Maine; The Sparhawk Oceanfront Resort, Ogunquit, Maine; 250 Main, Rockland, Maine; The Shire Woodstock, Woodstock, Vermont; and The Emerson Inn, Rockport, Massachusetts. Follow us on Facebook, Instagram, and Twitter: @MigisHotelGroup. For more information, visit http://www.migishotelgroup.com.